Did you just move into a new house and don’t know what to do with that yard out back? It’s hard to create backyard landscape ideas, as changing the space behind the house can be very daunting. Even generating small backyard ideas can be tough. Well, thankfully, here are some backyard ideas to make your lawn spectacular. A little H2O can turn a bland greenspace into a plethora of beauty and fun. You can get fancy or keep it simple; be as creative as you want. Water can be used for backyards big and small, and if you have kids they will love to frolic in whatever design you choose. You can keep it simply with sprinklers, or have fun with larger waterscapes such as ponds. 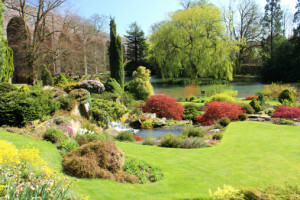 Keep in mind that ponds require upkeep and cleaning. Sprinklers on the other hand, are a great way to keep your lawn healthy and entertain your kids! Yes, the traditional backyard is mostly grass, but why be traditional? Add some hardscape back there to give your backyard a kick. Whether it is a rocky walkway, a nice winding sidewalk through a garden, or just a driveway for a car or two, hardscaping is convenient, low maintenance, and the little man-made dash you need to really push your yard over the top. You may also want to consider a fire pit. Fire pits make a very nice addition to any backyard. Fire pits are great for warmth, beauty, and bringing people together. For more information about fire pits, be sure to check out our tips and tips on our Green Blog! Unless you live in a seasonless utopia, your backyard will have to adjust to the time of year. Your yard will obviously look different in ninety degree sunshine than during a winter blizzard, so your set up should differ as well. Get vibrant colors during the summer, some nice holiday shrubbery in the winter, or whatever seasonal displays you think fit with your backyard. Yes, tree houses seem like a childish backyard idea, and are more recommended to those of us with kids. But even if you don’t have little ones, consider putting a nice retreat just out your backdoor. Treehouses can be simple to set up and function as a great place to relax. Stressed out about work, family, or whatever other annoyances pop up over the course of one day? Just bond with nature feet from your backdoor! Afraid of heights? Consider instead, a gazebo or small patio area to relax or to entertain guests. Hammocks are the epitome of relaxation; one can easily forget about the stresses of everyday life by swaying back and forth in their backyard. 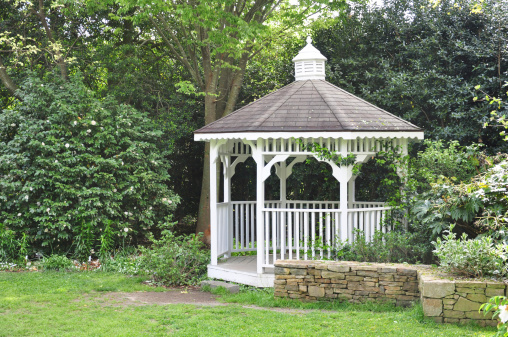 They are also relatively easy to set up and can beautify a backyard more than one would think. Sometimes, hammocks are the finishing touch no one considers. Those are just a few backyard ideas, but there are clearly many more out there. If you have an idea for landscaping your backyard, or would like more tips and tricks, be sure to visit our blog or contact the experts at Greener Horizon. We can turn your backyard into a personal heaven.